Thelma Ritter is one of the most beloved character actresses of all time (at least according to me anyway). She appeared in many classic films starting with Miracle on 34th Street. Test your knowledge of this iconic actress by checking out the 10 facts below. 1. Family friend, director George Seaton, cast her in her first movie Miracle on 34th Street (1947) and her last, What’s So Bad About Feeling Good (1968). 2. She was uncredited in her first three movies: Miracle on 34th Street, Call Northside 777 (1948), and A Letter to Three Wives (1949). 3. Ritter was nominated for six Oscars—all for Best Supporting Actress. 4. Her first Oscar nomination was for her role as Birdie in All About Eve (1950). 5. Her name was above the title for the first time in The Model and the Marriage Broker (1951). 6. She played a character based on Molly Brown in Titanic (1953). 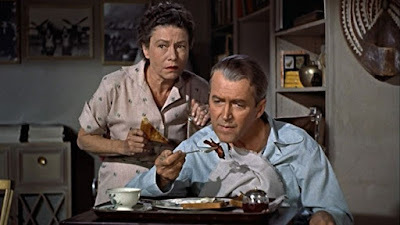 Thelma Ritter ruins James Stewart’s appetite in Rear Window. 7. She was not nominated for her role as Stella in Rear Window (1954). 8. Co-hosted the Oscar ceremony with Bob Hope in 1954. 9. She won a Tony Award for Best Actress (Musical) in New Girl in Town (1957) in a tie with costar Gwen Verdon. 10. She died nine days before her 67th birthday in 1969.